Want to shoot 3 gun on a budget? You're gonna spend close to $1000 for a quality 3 gun shotgun. The Benelli M2 and M4, and the FNH SLP are the top of the food chain as far as tactical shotguns go. 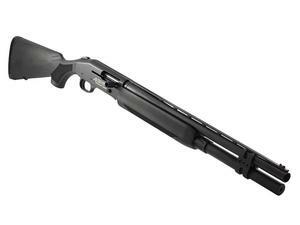 But Mossberg is lurking in the bushes and for about half the price, you can have a reliable, tactical shotgun for home defense and competition. I started out with a base Mossberg 930 Turkey 12 gauge shotgun, and will slowly be adding parts to ready up for 3-gun. First on the list was a Nordic Components magazine tube extension. I can now load up to 12 rounds in the 930 (10 in the tube, 1 in the chamber, and 1 ghost loaded). Most competitions won't allow that, but if they do, WATCH OUT! For VIDEO of the Nordic Components Magazine Tube Extension onto my Mossberg 930, click HERE.